The Kremlin in XII – mid XV cent. In the end of XV – XVII cent. XVIII - XIX cent. By the Tsar’s order it was forbidden to build constructions in Moscow higher then Ivan the Great (81 meter). The Menshikov Tower was the first to break the rule. 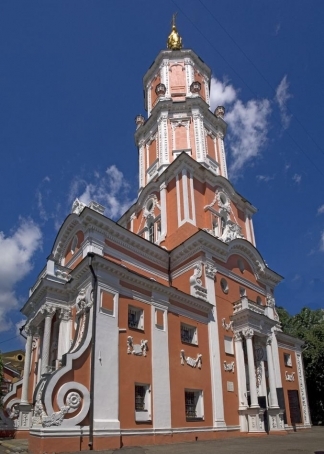 In the early 18th century, Prince Alexander Menshikov ordered a Church of Archangel Gabriel (the Menshikov Tower) in Moscow. Initially the building had four structural stone levels and the wooden fifth level, decorated with the English chiming clock and crowned with a 30-meter spire with a gilded statue of Archangel Gabriel. Altogether, the tower was 3 meters higher than the Ivan the Great Bell Tower. People called the Menshikov Tower “of Ivan the Great’s sister”. In 1723 the stroke of lightning blew off the huge spire of the Menshikov Tower. Again Ivan the Great became the highest building in Moscow. That event was immediately interpreted as a punishment to the prince for his pride, as he put himself higher then tsars. And even in 1913, when the new bell tower was erected at Rogozhskoe Cemetery for Old-Believers, there was a special order to make it one meter lower then Kremlin’s Belfry.